Summer Vacation means summer parenting time schedules for divorced parents. Parent communication is important, but sometimes miscommunication occurs about summer plans and the holiday schedule between parents. My advice is that it is never too early to start planning for the summer. Parents should both agree on which activities and camps the children will be participating in and schedule them on the calendar. Hopefully, the parents will agree to split these costs and can each parent can pay the provider directly. What about taking vacation with the kids? The nonresidential parent in the Deschutes County Standard Parenting Plan gets to let the residential parent know what dates they want to have parenting time by May 1st. This is an important deadline so that the residential parent can plan around those dates. If older children are involved and the parents both live in the same town, the plan calls for neither parent to have the children for more than 19 consecutive days. The parenting plan designers’ intent was that children have contact with both parents during summer. 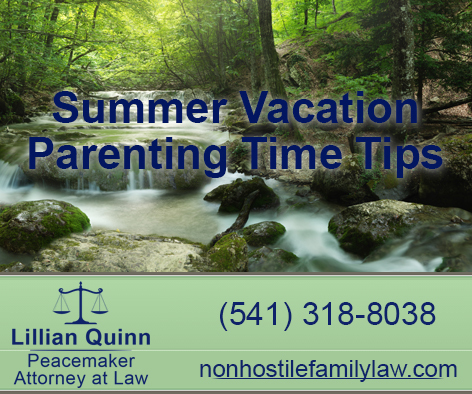 The long distance plan allows the nonresidential parent to have the majority of parenting time in the summer especially if the parents live a long ways from one another. This makes sense because of the expense of traveling back and forth are avoided by reducing the number of trips between parents. Each family situation is unique and it is hard to mandate a uniform schedule. Remember, the key to making the schedule work is flexibility and communication. If Grandma is visiting from New Jersey, it wouldn’t hurt to allow the children to have parenting time so they could see her even if it wasn’t set out in the plan. Get the schedule set in place and on a calendar as soon as possible! You can access free monthly calendars online. Make sure both parents and the children have a copy of the summer calendar. Summer is a wonderful time for children and keep in mind that they love both parents and want to spend time with each. Plus they really want to spend time with their friends. Don’t stress the kids out by “fighting” about who gets them when. Everyone loses when this happens. Please consult my office should you have a question or concern about parenting time issues or any family law issue. *If you would like to set up a consultation please call us at (541) 318-8038, or, submit your information below.